The character of climate change part 2 | Watts Up With That? What is the utility of the globe to humanity at this particular point in the evolution of the Earths disparate climatic regimes? Has there been an improvement or deterioration in recent times. To answer these questions we must look at the pattern of temperature change by latitude. Figure 1 The Northern Hemisphere between the equator and latitude 60° north. Both summer maxima and winter minima fell away between 1948 and 1976. Summer maxima and winter minima then rose until 1998. Summer maxima and winter minima have been fairly stable since the turn of the century. 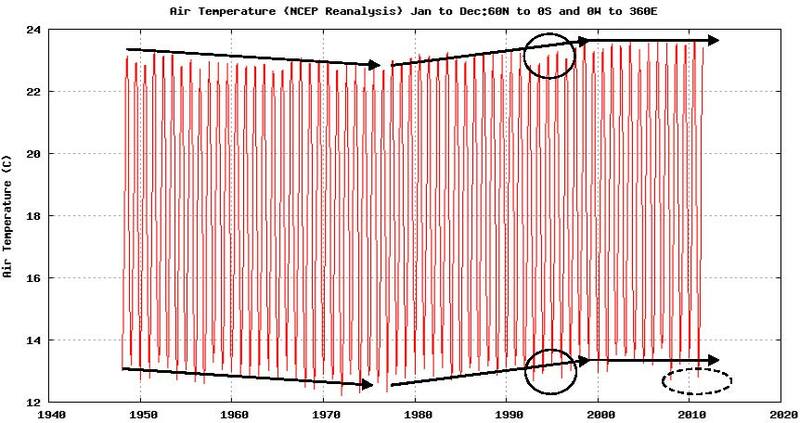 In 2008 and 2011 winter minima are almost as cool as those experienced during the period of cooling between 1948 and 1976. The January minimum exhibits much more variability than the July maximum. Summer maxima are short of the 25°C optimum temperature for plant growth. Cooling is evident after the eruption of Pinatubo in 1991. The habitable part of the northern hemisphere is three degrees warmer in July than the southern hemisphere in January. This is due to atmospheric heating and cloud loss associated with the higher ratio of land to sea in the northern hemisphere. The sea is transparent and absorbs solar radiation. The surface of the land heats quickly and returns energy to the atmosphere, warming it and reducing cloud cover. Hence we have the paradox that the Earth as a whole is warmest when it is furthest from the sun. There can be no better illustration of the importance of cloud cover in determining surface temperature. The Earth tells us about feedback effects when the atmosphere is loaded with energy. The feedback is positive, due to the loss of cloud. Hypothetically if the atmosphere became drier over time, cloud cover would diminish and temperature would increase. Conversely, if the atmosphere became wetter temperature would decrease. The drying of the atmosphere (reduced precipitable moisture) has been a powerful source of natural climate variation and directly contradicts the postulated wetting of the atmosphere that is built into the climate models beloved by the United Nations International Panel on Climate Change. Those who write UNIPCC reports do not let the facts stand in the way of a good story. Check out how the atmosphere dried between 1948 and 2005 at: http://www.esrl.noaa.gov/psd/cgi-bin/data/timeseries/timeseries1.pl So, the Earth system itself tells us that the water vapour feedback effect as the atmosphere warms, is negative. The atmosphere becomes more transparent to outgoing long wave radiation, not less transparent. Both maximum and the minimum air temperatures increased between 1948 and 1977 and jumped to a new plateau in 1978. These latitudes of the southern hemisphere warmed at precisely the same time that the same latitudes in the northern hemisphere cooled. A plateau was maintained between 1978 and 2011 as temperature in the northern hemisphere increased strongly. There is a marked ‘Pinatubo’ effect after 1991, more so that in the northern hemisphere. Summer maximums (January) are more variable than winter minimums. Winter minima are raised and stabilized to an extent by the radiation of heat from the northern hemisphere that drives the cloud away in mid year. The atmosphere dried after 1978 and the consequent loss of cloud should have produced a warming surface. 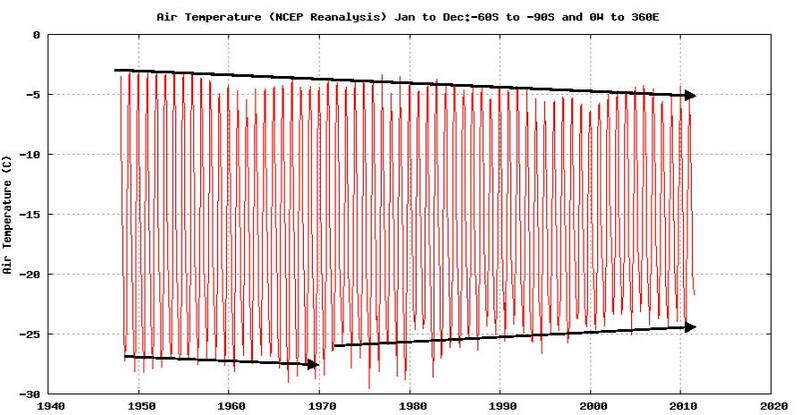 The fact that the surface temperature is stable after 1978 suggests that some other influence has been responsible for a compensatory cooling. The years 1973, 1983, 1978 and 2010 are outliers in that summers are much warmer, peaking at 20.25°C. Let us note that even in the warmest summers, maximum temperatures are well short of that in the northern hemisphere and well short of the optimum for plant growth. It is nonsense to suggest that the globe is becoming too warm if the global mean reflects warming in parts that are insufficiently warm. This part of the world is insufficiently warm. Why did the southern hemisphere warm between 1948 and 1978 as the northern hemisphere cooled? Is this consistent with the suggestion that it is change in the atmosphere that is responsible for the temperature increase? Why is variability greater in both summer maxima and winter minima in the southern hemisphere than the northern hemisphere, particularly as this hemisphere is dominated by water which is supposed to have a moderating influence on climate? Is this not an indicator of a phenomenon that drives climate change by hemisphere rather than impacting the globe as a whole? Why did the summer maximum in the southern hemisphere stabilize after 1978 as northern hemisphere temperature increased? Should we really be concerned at this rise in temperature in the southern hemisphere when the current temperature regime is sub optimal for plant growth? How valid is the global mean as a metric of planetary welfare if it is inflated by a rise in temperature of a location that is insufficiently warm? Should we not congratulate ourselves on our good fortune that the southern hemisphere is slightly warmer today than it has been in the recent past rather than beat our breast in anguish? Since the late 1970’s the habitable latitudes of the southern hemisphere have made little contribution to the advance in global temperature. The question arises: if greenhouse gases of anthropogenic origin are responsible for the increase in the global mean that is evident after 1978, why is it that we see little or no advance in either maxima or minima in the vast bulk of the southern hemisphere? Can we eliminate the greenhouse theory as irrelevant on the basis of this information? Why is it considered that the globe is in danger of becoming too warm? Our interest is in ensuring that the capacity of the planet to support life in all its forms is not impaired. In the warmest parts of the globe, the parts considered thus far, temperature is sub optimal for plant growth and particularly so in the southern hemisphere. All life depends upon plants. We would be better off if the planet were warmer. It is further cooling that represents a threat to human welfare. We have plenty of scope on the upside. Let’s put these highly pertinent questions aside for the moment and look at the climate of the rest of the globe. In high latitudes the thermal regime is either seasonally or perennially cold. I am sure that most will agree that climate pole-wards of 60° in both hemispheres is inhospitable to man. These regions contribute to the global average temperature. But it is already apparent that the ‘global average’ is a statistic more suitable for posturing and propaganda than practical decision-making. I don’t think we will ever persuade the people of Scandinavia, Siberia or Alaska that winter cold is a good thing. One has to congratulate the proponents of the AGW cause on their tactics, if not their science. Concentrating on the global mean is a good debating technique. They have won over the parroting media and the coffee shop ‘intelligentsia’. They have the universities stacked with ecologists and environmentalists. They have well-funded bureaucracies acting as environmental policemen. Local governments are obsessed with rising sea levels, sustainability and preserving the bush. But, can the environmental movement live with its conscience when the grand theme of anthropogenic climate change is so patently flawed? Is there a conscience? Figure 3 The northern hemisphere north of latitude 60° north. 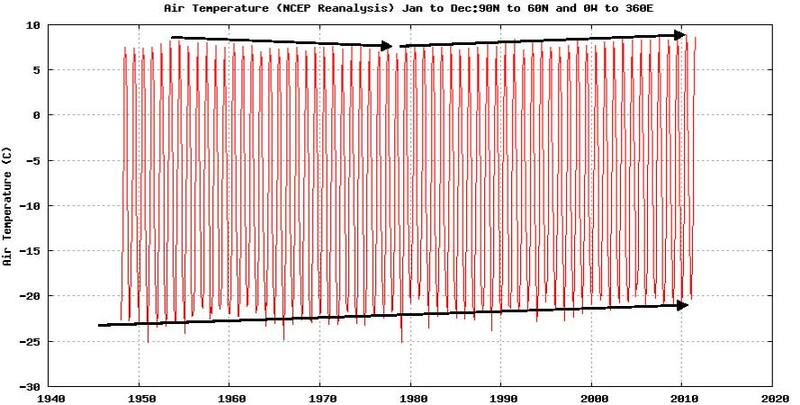 North of 60° north, a region conveniently described as the ‘Arctic’, we see relatively large swings in temperature over time, concealed in this graph by the expanded scale due to the large annual range. However, the summer maximum is remarkably invariable. Winter minima are highly variable and have been rising over the entire period of record. Plainly climate change effects the minimum temperature with little change in the summer maximum. But anthropogenic influences are not capable of distinguishing between summer and winter. It must be some other factor that is causing change. Despite the increase in winter temperatures there is little prospect that this area will be favorable for human settlement at any time in the near future. Temperatures between 10°C and minus 20°C are seriously cold. Those few who live in this part of the world will no doubt be pleased about the reduced incidence of extreme cold in winter and the very slightly longer period of temperatures favorable to plant growth that are available on the southern margins of the zone, the reduced incidence of ice on their roads and snow on the roof. In terms of productivity, and sustainability, the variation in temperature north of latitude 60° north should be of little interest to us, particularly when the mean is simply responding to change in the winter minimum when nights are long, bears must hibernate and self-respecting Eskimos are holed up in their igloos. But, perhaps this is just an ill-informed Australian perspective. Perhaps the Finns actually enjoy their long winter nights, warm saunas, running naked in the snow while birching each other under the stimulating influence of vodka? This could be fun, but perhaps for a shorter interval, not the entire winter. Figure 4 The Southern Hemisphere south of latitude 60° south. South of latitude 60°south, summer maxima are well into the freezing range and have declined over the entire period ensuring that ice is never in danger of melting. But there has been a strong increase in winter minima since 1970 that is presumably much appreciated by male penguins that stand together resolutely keeping their eggs warm. The wind chill factor is aggressive. Three million square miles of ocean freezes on the margins of Antarctica in winter and despite the increase in the winter minimum the area of ice is increasing. The mean temperature in Antarctica has increased despite the strong fall in summer maxima. With summer maxima currently at minus 5°C and winter minima at minus 25°C this part of the world is for hardy explorers with too many fingers and toes. It is a place for research rather than habitation. The strong increase in the ‘mean’ temperature in the Antarctic contributes to the rise in the global average. Again, we must ask just how appropriate this ‘global average’ really is. If we are truly concerned with planetary welfare, the gross product available for consumption by human and other species, the area of the globe capable of supporting habitation, personal comfort and the supply of vodka, what happens in this part of the world should be of little concern, unless the ice were to melt and there is no chance of that happening. Despite the increase in the winter minimum temperature the Antarctic ice pack is still as large as Antarctica itself, and growing. Firstly, let’s acknowledge that the idea that the earth is in danger of overheating is nonsense. Our planet would be more habitable if it were several degrees warmer. Secondly we must ask whether the pattern of temperature change that we observe can be explained by the greenhouse thesis. The answer must be in the negative. If we seek to explain change in temperature we must look for a mechanism that affects temperature between November and March to account for the variability that is evident at that time. In addition we must explain the strong variation in winter minimum temperature at high latitudes. We don’t have to look far for the cause of the variation in temperature between November and March. It’s the El Nino Southern Oscillation. Is there any agreement as to the cause of this phenomenon? No. Can we rule it out as a possible cause of climate change? Obviously not. No ‘forcing’ like trace gas composition, that is common to the globe as a whole, and subject to the same increase regardless of season can explain the observed pattern of temperature change. Plainly, something entirely different, something that is hemispheric and seasonal rather than global in its impact, is responsible for this change. I think we will wait in vain if we expect the UNIPCC climate panel to discover the cause of the variations that we observe. These people take their cue from Lord Nelson. Look the other way. Turn a blind eye to that you do not wish to see. But, carbon taxes and emissions trading schemes should be off the agenda. And we should forget about our ‘carbon footprint’ and the notion of ‘carbon pollution’. That is nonsense. It is about as relevant as the medieval notion that climatic misfortune is due to witchcraft and bad behavior. August 16, 2011 in Climate_change. Interesting analysis. I think that the individual months have better story to tell then the annual averaging. Influence: early experience of grape vine cultivation, wine making and brandy distillation. Expect: GW would be good for humanity. Concern: Damnant quod non intelligunt! Not to throw water on all your work, genuenly curious: Normally, down at the micro level of weather (and climate?) we see Humidity and Pressure thrown into the mix along with temperature, recently some have questioned the “correctness” of only using temperature as a guage of global climate change. Is anyone trying to graph variations in either of these two additional measures at the macro level? 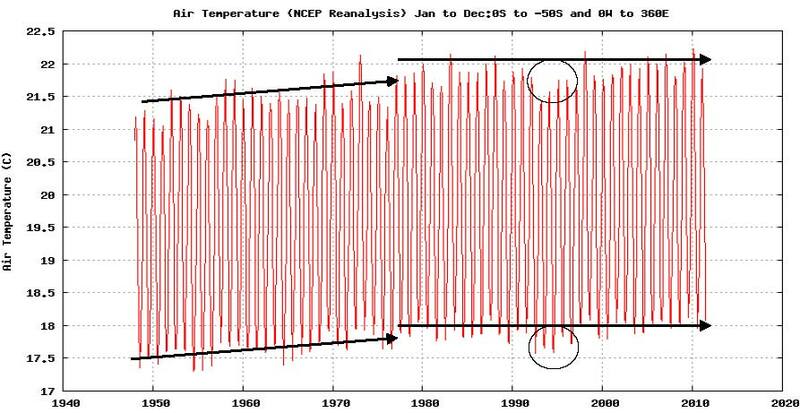 How were the black lines bounding the max and min temps fitted to the charts? how important these issues are for our children’s futures are: good on you! Interesting analysis, definitely needs more than a few minutes read. Concern: We may be looking the wrong way when something serious comes along. Wow, now that’s an analysis that all should review. And by all, I mean skeptics, scientists, Gore and his followers. I think those graphs say a boatload on a near global scale! Sorry but this is numerology to me. I don’t have problems with studying individual months separately but selecting just two out of twelve seems to be a bit too few to me – the months in between are not less interesting just because it’s steadily warming or cooling during them. Also the turning points you selected on the timeline and trends drawn between them seem to be quite proprietary rather than given by some kind of statistical analysis. For instance, each of them has completely different error margin. Globalwarmists may not attribute climate change to witchcraft, but they certainly do attribute it to bad behavior, as defined by them. Another fabulous piece of work that honestly gets to grips with realities and details of summer and winter maxima and miniama. Most interesting. Can you please give us details of the reference and source for the graphs please. Thanks. Sorry. Just spotted the link to the ESRL site. About the Finns and vodka: it’s another consensual illusion that it’s stimulating and inspiring. Physiologically it’s numbing and stupifying. But factor #2 makes it seem the opposite. This is called “positive feedback”. With apologies to all potato growers and viticulturalists. The atmosphere becomes more transparent to outgoing long wave radiation, not less transparent. I thought your argument was that as temp rises, and cloud cover increases, more sunlight is reflected. That would mean the atmosphere becomes more reflective to incoming short wave radiation, surely? Splendidly done. Not so technical as to be incomprehensible, and coming from someone who has a practical interest in the issue. I hope you are going to send copies of this to all the pollies. Great set of graphs! Absolute proof that whatever may be happening, it ain’t global, so the cause can’t be any globally-acting effect. Special thanks for the link to the NOAA time-series maker. I’ve been looking for such a source without luck. By eye. Trust your eye. This is a big picture analysis. Let’s not get bogged down in the micro details. Thanks. Looks like you are more than usually qualified to speak out. It’s all numbers at the end of the day. If you don’t measure you don’t know. Believe it or not, the lines are based upon daily observations that cover the entire globe and careful calculations to cover the places where observations are not made. See the reference under the first figure. The point is that historically, as the surface warmed the water present in the atmosphere that is capable of forming clouds fell away. You can reach the same conclusion via an analysis of specific humidity or relative humidity. It’s valuable to look at the data by latitude band because the response varies by hemisphere and latitude. Second aspect: The warming of the atmosphere is accompanied by an increase in precipitable moisture (even though inadequate to restore cloud cover) and the condensation that occurs on a daily basis within a few degrees of the thermal equator drives massive uplift, pushing the tropopause upwards to 18Km or thereabouts (erosion of ozone by water vapour) and driving the Hadley cell. This ascent at the equator is matched by descent in the high pressure cells centred on about 30° of latitude. Here, air warms as it descends and the air radiates to space. It is important to realize that this is the source of most of the radiation going to space. The air in this descending column of air is now low in humidity. It has no cloud. There is little water vapour to support a greenhouse effect. 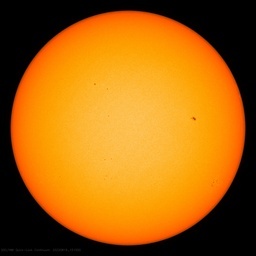 So, at these latitudes the atmosphere becomes less reflective of solar radiation (less cloudy) as the overturning circulation accelerates and the surface area occupied by these high pressure cells increases. Fortunately the effect is greatest in the winter hemisphere. So, we see in this process the Earth’s natural thermostat is ‘sticky’ and warming promotes warming via loss of cloud cover. However, at the peak of the warming process in 1998 the limit was reached, the atmosphere became so wet that a massive precipitation event followed as the force that promoted warming collapsed. Next post is about the force that promotes warming. My Chapter 5 surveys the change in humidity that has occurred. Thanks for the corrections. As for the pollies they never get to see this sort of stuff. The information stream is managed by their minders. They live in a bubble. Earl – from my observation, on the east coast of Australia, when it’s dry, it’s hot. When it’s wet, it’s not. I think this is consistent with your observations. The idea that it will be a wetter world with global warming, conflicts with observations. That itself is constant with AGW theory. Almost every aspect of AGW theory is the inverse of reality. Sorry Erl – I got your name wrong. Is there any good reason why an analysis of global warming should focus the minimum and maximum temperature for each year? (These are the values whose trends you have fit by eye with your lines.) The minimum and maximum temperature presumably refer to 2 days out of 365 each year. Is there any reason to throw away data for the other 363 days? Does the output of your vineyards depend on the highest and lowest temperature each year or the climate during the whole growing season? You keep making statements that are mere correlation and then implying causation. You don’t have a proven mechanism for land surface temperature to control cloud cover exclusively or even partially and have no way of testing for one. That’s a general problem with atmospheric science. I think the case against AGW is very well made with correlation and *lack* of causation (such as warming precedes CO2 increase & not the reverse) rather than a positive assertion of causation. If you haven’t run into trouble with your line or argument, you surely will at some future time. For example, there is more to cloud cover than mere moisture. The way you tell the story here, it’s just moisture as if the atmosphere is one giant barrel that either contains moisture of it doesn’t. The effect of moisture tends to be context-dependent, and, you’re removing the context. I was looking over some of the responses you’ve gotten from the warmists and could only find one. I from 2008 which was a terrible ad hominem, but, it doesn’t look like anyone is responding to you. I’m sure you think this means that you’re winning, but, it could mean that you’re being ignored. Your statement “The atmosphere becomes more transparent to outgoing long wave radiation, not less transparent.” sounds like it would be patently false for real world conditions. Clouds, rain, fog all contribute to atmospheric moisture, and, they will scatter light better than open air. Is there some sort of condition you have in mind, possibly with experimental verification? Everything I can find says you’re wrong with such a blanket statement. These are not minimums and maximums. All the months are in there and if you stretched the bottom axis you would see the annual rise and fall of temperature by month. The mean temperature is the result of the addition of the daily max and min divided by two. We are better off knowing what the Max and Min were. We can see that they vary differently and that is important to know. It tells you something that assists in discovering the mode of causation. How refreshing to see some analysis that focuses on real units rather than anomalies. And oh look, it’s not nearly as scary. Not that anomalies are necessarily wrong, but that they need to be viewed as part of the big picture. Have you seen the latest doomsday report from the Oz Federal Dept of Climate Change? South West of WA to experience 2m of sea-level rise…? And if you in any way connected to the Happs Winery, I doubly thank you Sit, and kindly request that you PLEASE do not give up on the day job – much as I enjoyed readying the post, I love your wines more! Yes indeed. When presenting the GW issue to university students, I always show them graphs with huge monthly/daily temperature fluctuation, and then point out how thin the IPCC “0.74 degC (per century)” is. They grasp it immediately. Land surface AREA by hemisphere is closely related to the flux in hemispheric and global temperature. The land quickly returns heat to the atmosphere, the ocean does not. Cloud cover is a function of relative humidity. If the temperature of the air rises and humidity fails to keep pace (easy to prove if you look at the data) then cloud cover must fall away.And that is the reason why the Earth is warmest when it is furthest away from the sun in mid year. Re: Your statement “The atmosphere becomes more transparent to outgoing long wave radiation, not less transparent.” sounds like it would be patently false for real world conditions. Sorry, no. My reply to Jerome covers the point. It is true enough that at the equator the volume of moisture increases strongly with surface heating but energy goes into evaporation and driving uplift and there is very little OLR generated. So, even though the atmosphere here is becoming less opaque to OLR due to increasing water vapour it matters little. It is where the air descends that most of the OLR is generated and here the air is dry. And the area of dry air increases with the volume in the circulation. So, for this area, the atmosphere becomes less opaque as the surface warms. The OLR is generated in a very different place under entirely different circumstances. It is emanating not from the surface but high up in the atmosphere. Geography matters. We can not speak of the surface or the atmosphere as if they were spatially homogenous. Not a lot of comments: I take that as in general indicating agreement, or an unwillingness to state a contrary opinion. Perhaps I am wrong. Perhaps its all too boring and I am simply preaching to the converted. Yes, point well made. A plot of the raw data sometimes tells us much more than the anomalies. But, the anomalies come with part 3. Hopefully not too scary. This 2 metre sea level rise. Yes, Tim Flannery and his circus is in town. Sickening. It bottomed out about 1963 and rose until 2005 and is now declining. I would not be at all surprised if the next prognosis for what sea level should be doing, if it is based on the period after 2005, will show falling sea levels for this part of the world. As you say: “not nearly as scary”. That’s different than what I thought you were advocating. I thought you were advocating that moisture added to the atmosphere makes it less opaque than open air. You’re still guilty of mixing correlation with causation. That doesn’t make your conclusions wrong, but, it does give ammunition to those who want to contend with you. I really don’t have time to do a line-by-line critique, but, I really think you would benefit if you had someone to argue points with. If you know Monckton, he would be a good one. Fitting a least squares regression line to the min and max points would be somewhat more scientific as different individual “eyes” could result in different conclusions. You could use your same break point years, and others, and seek the flattest slopes as your test of your hypothesis of no change and actually measure the slopes of increase and decrease in those cases where such exist. Interresting that Mt Pinatubo doesn’t seem to show up in either of the 60+ regions, especially since climate modelers claim that radiative feedbacks will be amplified at the poles. Regarding causation, the chart looks more like a simple anaysis of what has happened with some comments on possible causes, as per the Mt. Pinatubo indication and the various comments, but the real thrust is not about cause. It does very nicely points out what has happened and that is very different from the warmists’ predictions of what was supposed to happen, irrespective of the why. It would, I believe, however, benefit from a more statistically rigorous fitting of the lines to the min/max of the charts. And the main point, made over and over in this analysis, which is so historically true, is that warm is better than cold for flora and fauna alike. So even if the AGW crowd were right, which it is obvious they are not, there is no need to destroy the world economy in order to prevent an improvement in our climate. If one wants to worry, worry about it getting colder, which is my bet. Very interesting article. Thank you. The information, insights, knowledge, etc. presented on this site is incredible. Correlates closely with regards to post by Willis Eschenbach on atmospheric circulations over the oceans. I’m looking at the big overall picture and trying not to get lost in details that, while possibly relevent, diverts from the bigger picture and understanding. I base my conclusions on common sense, observations, and physics. And the main point, made over and over in this analysis, which is so historically true, is that warm is better than cold for flora and fauna alike. Jim, You have nailed it. plants grow fastest at 25°C and if we wish to take advantage of that the local climate must vary between that figure for as many months of the year as possible. In most cases I would take the eyeball over a statistical analysis–especially when putting a puzzle together. We should never forget that Wegener proved statistically that the opposite sides of the Atlantic fit together, but this argument was ignored by the 99%. Statistical inference never adds anything that wasn’t already evident from proper data exploration. I spent a decade of my life around academic math/stats departments studying, tutoring, teaching, & researching. I learned more useful lessons on data exploration from a wildlife biology professor, who understood the futility of pretending that abstract assumptions hold up in practice. The paradigm’s misguided and its trendiness is increasingly running our society off the rails precisely because of untenable foundations (e.g. widespread economic planning based on patently untenable assumptions). If the assumptions don’t hold, the p-values DON’T mean what they’re supposed to mean. In that case, the sensible thing to do is stick to data exploration. To do otherwise is not only wishful thinking, it’s MALPRACTICE. I once interviewed a man called John Gladstones who had spent many years breeding lupins. He told me that if you couldn’t pick a difference by eye then it was not worth worrying about. So, he was quick and efficient at what he did, and his work laid the basis for the modern Australian lupin industry.He went on to do great work in viticulture. Fine. Why do you focus our analysis on the means of warmest and coldest two months out of twelve rather than all twelve?